You may already be aware that cabinet beds are very useful and functional pieces of furniture that take up little space. But did you know there are lots of variables when it comes to finding the best quality cabinet bed for your home? Here are a few things you may want to consider when shopping for cabinet beds. One advantage of buying a quality cabinet bed over a Murphy bed is that it is does not need to be attached to the wall for safety reasons. Your cabinet bed is just like another piece of furniture in that you place it in a room and can take it with you when you move. Assembly is minimal. How Easy Is It To Sleep? A quality cabinet bed should take mere seconds to get ready for sleep. A drawer pull at the top of the cabinet helps bring the face of it forward and down, revealing a comfortable mattress. And…that’s it. Ready for a good night’s sleep. 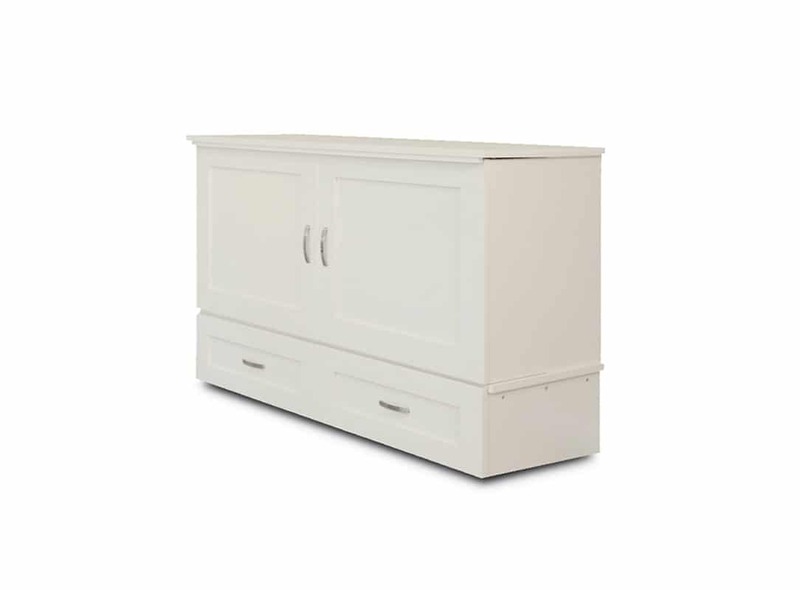 This Daisy Murphy cabinet bed takes mere seconds to get ready for sleeping. Does It Come With a Quality Mattress? The premium memory gel tri-fold mattress in this Park Avenue cabinet bed queen makes it comfortable enough to sleep in every night. Perhaps the most important factor in a cabinet bed is the quality of the mattress. After all, it should be far more comfortable than an innerspring mattress you would find in a sleeper sofa. With a quality cabinet bed from Murphy Beds of San Diego, you can rest assured that your cabinet bed comes with a premium, tri-fold gel and memory foam mattress in queen size. This mattress is so comfortable and supportive, you could easily sleep on it each and every night. While we are at it, let’s talk about the height of the cabinet bed. Low quality cabinet beds are often just a few inches above the height of the floor. That makes them difficult to get in and out of. 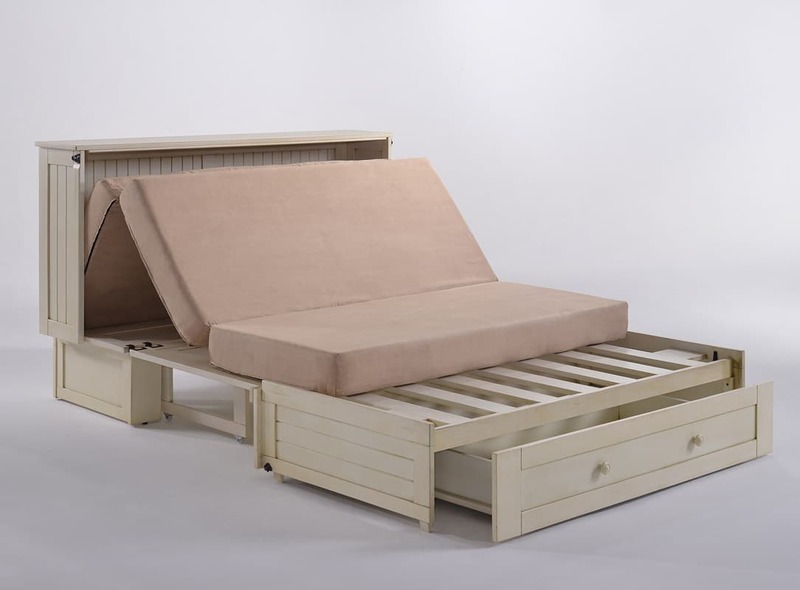 Our cabinet bed mattresses sit higher than most, making them more like a standard bed. Is the Cabinet High Quality? Here is another factor to think about in regard to a quality cabinet bed: how about the cabinet itself? Cabinet beds that are manufactured overseas are often made with cheap particle board and finished with toxic chemicals. 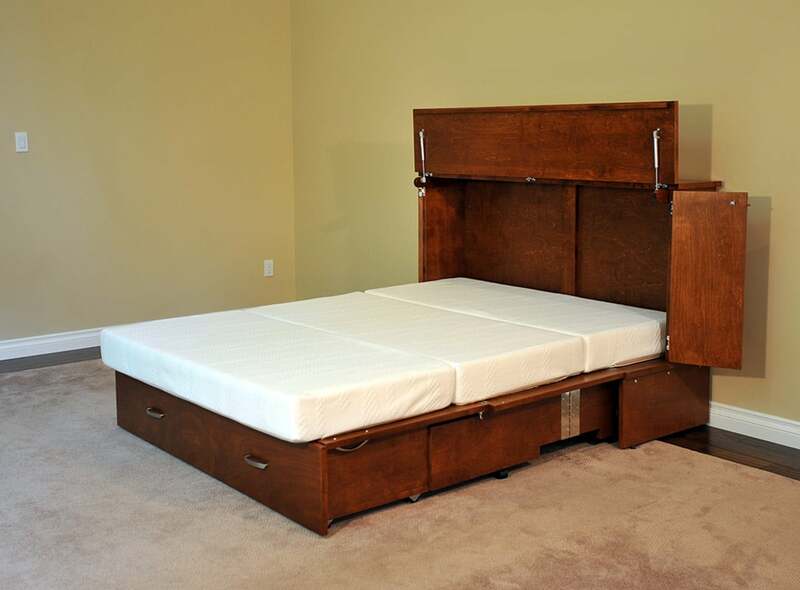 All our cabinet beds are fashioned from solid hardwood for superior durability and safety. 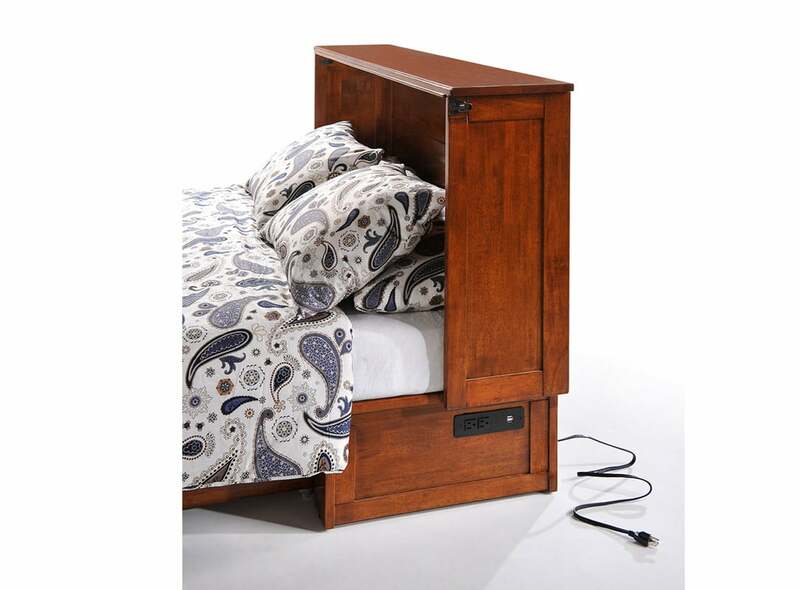 The Clover Murphy cabinet bed features dual USB/power outlets conveniently located at the head of the cabinet. When you have the quality cabinet bed in a style you like, think about the little details that will make it even more handsome. We’re talking about the finish color (wood finish or enamel? ), drawer pulls (some of our cabinet beds come with an alternate set), storage (how about a big, roomy storage drawer underneath the cabinet?) and things like a dual USB/power outlet at the head of the bed. These little details take your quality cabinet bed to the next level. Now that you know the important features in a quality cabinet bed for your home, why not browse through the options in our online store? All of our cabinet beds come with a comprehensive warranty, so you’ve got nothing to lose except a good night’s sleep for you or your guests.